I am a firm believer in the power of stories to not only bring joy and pleasure (and oh, they surely do) but also to re-right things that have become slightly upended in my obstinate struggle against the fog of everyday living. Er. Um. Well. Oh no. Bloody bother. Thus did a single line in a 300-page story wrestle with my curtains and doors today, curtains and doors that be heavy-hung and tight-locked for any number of days now. Plus: I will be an intelligent butterfly, thank you, and also a deeply profound butterfly who lives faithfully and wisely for many long years instead of a month like butterflies usually do. And also who flies with purpose and grace. Because I want a better story (don’t we all) that stars butterflies-as-I-create-them, and so I will fiddle with levers and buttons and pedals and engines back here behind the tight-locked doors and heavy-hung curtains (hiding out with other Kansas carnival vagrants who also want a better story that is perhaps a bit or a lot more concerned with what others see and perceive than what I actually live and am). The butterfly narrative is too lovely to give up. I want to keep it, but also remake it into something better, which is so typically foolish and smarty-pants of me. The butterfly narrative is woven deep into our transformation psyches and theologies. It’s quite lovely to thus imagine oneself. We do not easily surrender our narratives. Nor do we easily surrender our illusions and schemes and dramas. 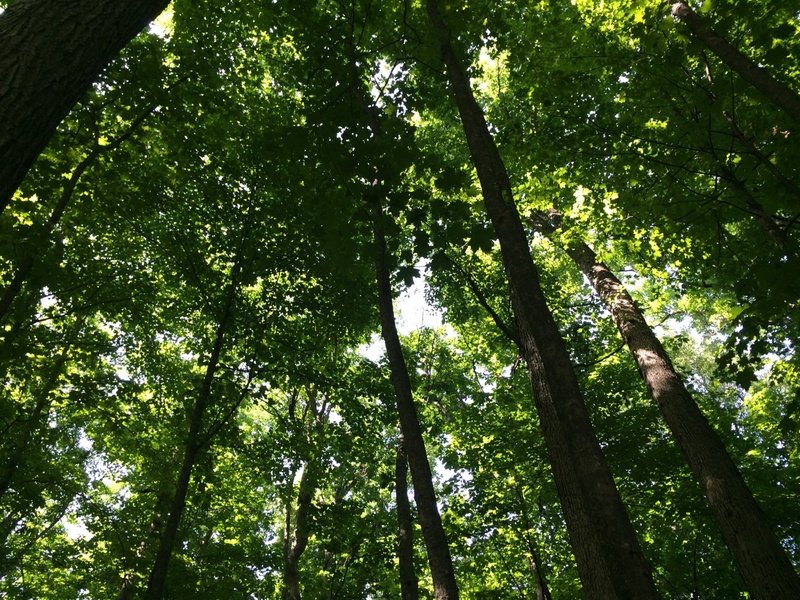 Trees. Planted by streams of living water. With roots sunk deep deep deep into Almighty love. Growing so slowly that one almost can’t notice it at first. Uncurling green leaves and bearing fruit. Resting seasonally as if life itself depended on it. Drawing life from unseen waters that flow with no end. Made of the same stuff on which Christ was hung – which is forever my humiliating shame and also my humbling glory. You there, the one fumbling through the days with no more purpose or direction than a little flashy flitting thing. Yes, you. The flash may be beautiful and impressive, my dear – but it is short-lived, even shorter than you know. Set it aside. Set it forever aside and instead plant yourself. Plant yourself and live. Friday is about the embrace of Christ as he wraps our sinful selves – each and every one of us muddy beyond measure – in his infinitely loving arms, taking our sins upon himself while hanging on the shockingly sacred cross. Saturday is about waiting with bated breath for the time to pass and for the Christ to breathe again. Knowing how the story ends does not lessen its glorious unfolding, and so Saturday is marked by holy suspense and wonderment. Sunday is about life, hope, joy, disbelief, deep belief, new clothes, and a feast to end all feasts. When that stinky, filthy, sorry and soiled son – just returned from a life of utter independence, and also utter pig stench – was embraced by his gracious, forgiving, gentle, and loving father, the story was not ended. That son needed cleaning up (done by the father) and new clothes (provided by the father) and a joyous welcome home party that blew the roof right up off the house in a burst of wild celebration (hosted by the father). The older son – who had never left home outwardly but had surely left it inwardly – wasn’t at the party, not because he missed it or wasn’t told. He skipped it. Entirely. Totally. Even after being warmly welcomed and invited. The older son didn’t want hugging. He didn’t want cleaning up. He didn’t want reclothing. He didn’t want rejoicing. He didn’t want a party – not that party, at least. And what we don’t want is not forced upon us. Ever. When Jesus hung on that cross – dripping with the stink and stench and filth of the world’s sins – and held all of humanity in his embrace while breathing his last, the story was not ended. Less than 48 hours after he’d been nailed to the cross, and maybe just 36 hours after he died – really and truly and totally died – Jesus’ tomb was empty. Really and truly and totally. This is rather a big deal. A stupendously, shockingly, and stunningly big deal, in fact. Resurrection doesn’t just happen every day (though a little part of me is brought to life each day after it has first died out really, truly, and totally). And of course, no matter how much he’d told them it would happen, his best friends weren’t expecting their really, truly, and totally dead leader to ever be anything other than really, truly, and totally dead. They didn’t know the end of the story yet. Their suspense and fear were real. Truly and totally. So you can imagine their surprise when just 50 or so hours after watching him take his last breath, they saw Jesus right there with them – where they huddled behind locked doors for fear of what might happen to guys who were friends with the man who had turned the world upside down really and truly and totally. Also understandable: their fear of what might happen to them was nothing compared to the shock of what did happen to them. Seeing a dead guy, that is. Who was really, truly, and totally no longer dead. He spoke. He embraced. He laughed. He comforted. He breathed in and out, in and out, in and out, no more breathing his last, now re-embodied in flesh and blood – flesh no longer just human and blood no longer merely shed. And then the unthinkable: the risen Christ, breathing in and out, in and out, in and out – really and truly and fully alive – breathed in and out right onto his friends, much like God breathed into the first of humanity, eons and ages and lifetimes ago. “Don’t fear,” he said. “It’s me,” he said. “I’m here,” he said. “Be at peace,” he said. So you see, there is no doubt that we all – each and every one of us – takes God’s breath away – not by force, but by the depth of his own holy love: first on the cross, where he breathed his last; then at the party (for that’s what happened behind those locked doors on Sunday night – a party indeed), where he breathed their first. Our first. The Lord is risen. The tomb is empty. We have been cleansed. Our spirits are full. We know how the story ends. Let’s now live into its glorious unfolding – really, truly, and fully. You may not go outdoors by yourself. Ever. It could not have been simpler, clearer, or more reasonable. Stay in with mom or go out with mom. Those were the options. On that particular Wednesday night when the dinner hour arrived – for which I had miraculously cleaned up, not a small thing in the days of small children – I could not find the child. Anywhere. Which was not entirely new or unexpected. He had no great love for being found. I methodically checked inside closets, under beds, down basement stairs, and behind the shower curtain. I rechecked inside closets, under beds, down basement stairs, and behind the shower curtain. Front-crawling through the mud puddles he was, because there is nothing better than swimming if you are not quite three. You may not swim in the driveway mud puddles. Ever. 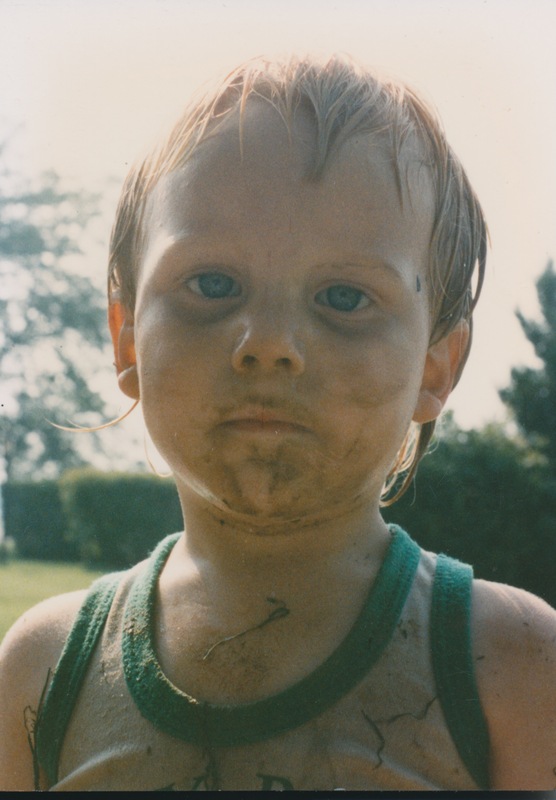 Do you know what happens to little boys who sneak outside to swim in mud puddles? They turn into mud pies and spend their whole lives living in muddy muck, eating dirt and slime, crying because they are locked out of the house forever and ever and ever. That’s what. I considered it. I really did. After all, I was clean. That doesn’t happen every day when the kids are not-yet-one and not-yet-three. But it was chilly out. And people were getting hungry. And there are no beds or books or blankets out in the mud. And he was a child, – my child. Here I am. I’ll help. He was not interested in being helped. I wrapped my arms around him anyway – because sometimes mothers must; cringed as the muddy slime smeared all over the clean me – because where else could it go; felt that precious not-yet-three boy against my body – because that’s right where it belonged; and caught my breath – because, gracious sakes alive, mother love will take one’s breath away, no matter how much muddy slime drips around the edges. Which was more than enough. More than more than enough. But not enough for the boy. Not nearly enough. What he wanted was a dead dad. Because that meant money. And money meant power and freedom and life. Everyone knows that. But the power, freedom, and life drained out dry, leaving behind nothing but the slimy filthy stink of hopeless disgrace and shame-filled self that dragged on and on and on until even the disgrace and shame was sucked dry, a lifeless shadow of its lifeless self. You? Here? You?? Here?? YOU ARE DEAD TO ME! But he never considered it. Not even once. Not even though he had every right to. 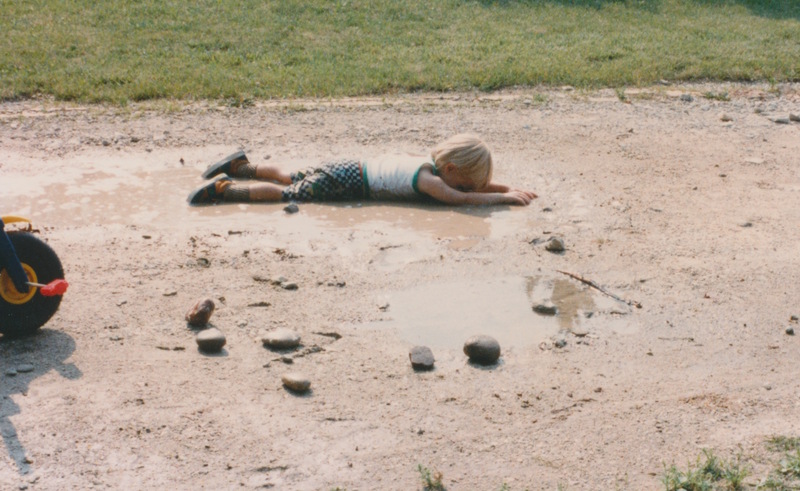 This was not a child in a puddle. This was a soul in a tempest. So: filled with love and compassion, he embraced the boy; and when that filthy stench of death and shame smeared all over his own unsullied self, he did not cringe, draw back, cover his eyes, or hold his breath to keep out the stench. 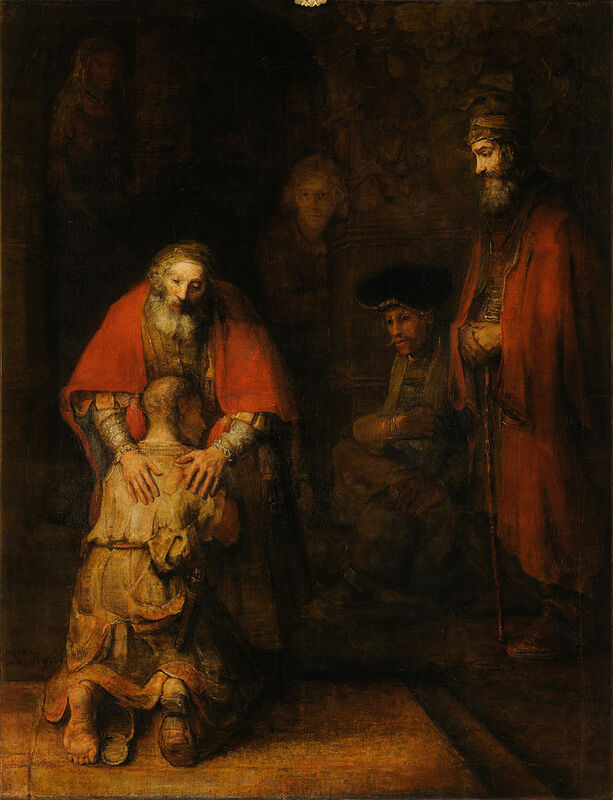 Rembrandt: the father embraces the son. But indeed, he did catch his breath – because gracious sakes alive, a holy love will take the Savior’s breath away, no matter how much sin drips around the edges. And drip it did. 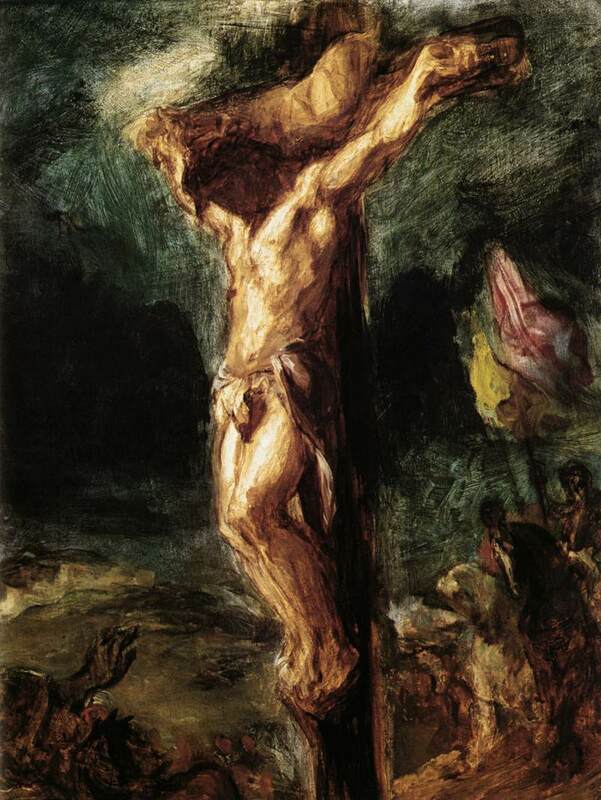 Drip and smear and suffocate, all over the Savior while he hung there on that gloriously death-drenched cross, holding us in his breathtaking embrace, hugging us from death to life. And then he breathed his last. Because we really do take God’s breath away – that day, this day, every day.